The Dangan series returns for Dangan 88 on November 29th and is a show that genuinely has had us really interested since we first had details of it and for several reasons. The key reason that we've been so excited about this card is due to it featuring Tadashi Yuba's rematch with Yoshihisa Tonimura. The men, who fought to a split decision in favour of Yuba earlier this year, will be fighting over Yuba's Japanese Light Middleweight title. 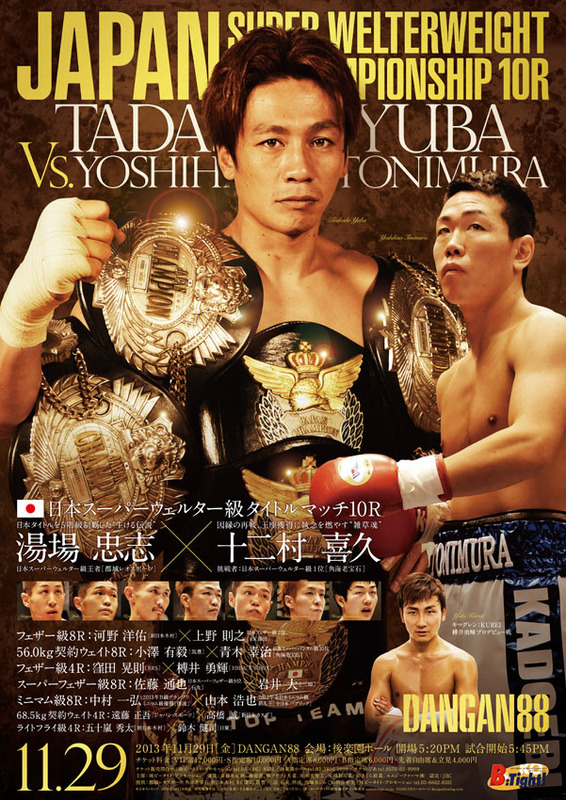 Yuba, defending the belt for the first time, became Japan's first ever 5 weight national champion when he won the title back in August and will be looking to further cement his place Japanese boxing history. One of a number of secondary reason's that we're interested in the show is due to the debut of Japanese singer Yuki Clay, AKA KUREI from Kimurguren. As well as those two notable contests the card has several other ranked fighters in action in what is one of the best domestic cards of the year. In regards to the poster it does look very, very busy but yet also features all the information needed. The main fight of course takes centre stage why KUREI also takes up some notable space but the poster does keep with the theme of a number of over Dangan posters. No real issue with the poster from us!